Photo Gallery: Coral Life Of The Netherlands Antilles Coral reefs are the rain forests of the oceans — teeming with diverse and postcard-perfect fish, towering sponges and multicolored coral. In these photos, Dr. Mark Vermeij, scientific director of the Caribbean Institute for Research and Management of Biodiversity (CARMABI), documents the diversity of life in this magnificent — yet fragile — underwater world. Glassy sweepers are small nervous fish that can cluster in groups of 100 or more.When they're young, their bodies are nearly transparent, allowing an observer to see what these fish just ate. 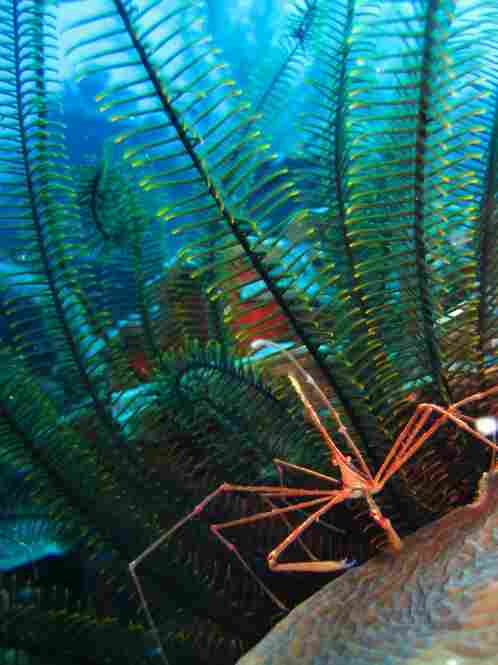 In deeper water, wire corals, like this one, can grow ten meters, or 32 feet, in length. 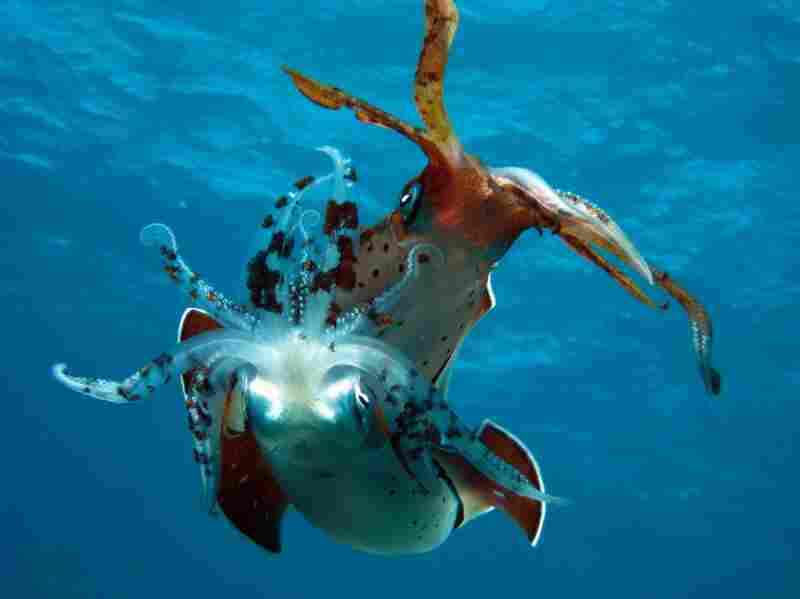 This animal uses tiny tentacles to capture food particles floating in the water. 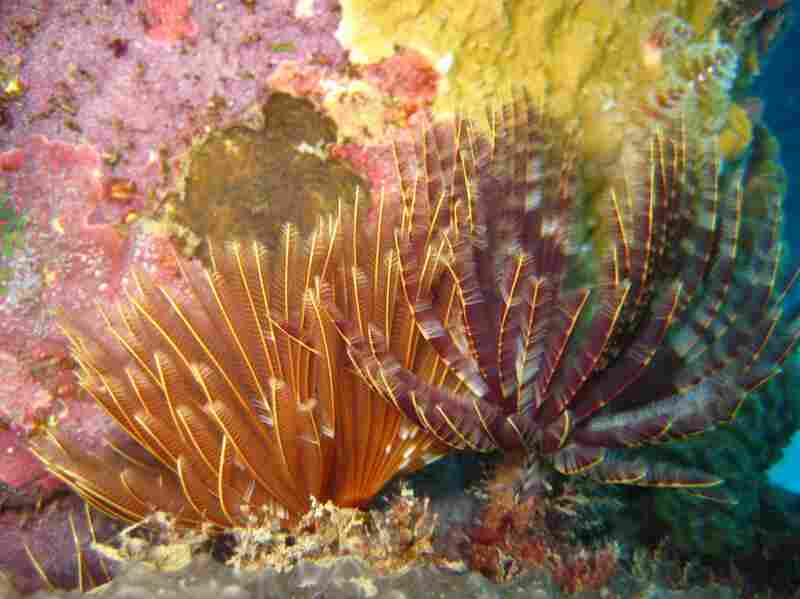 Like many other reef animals, magnificent feather dusters resemble plants. 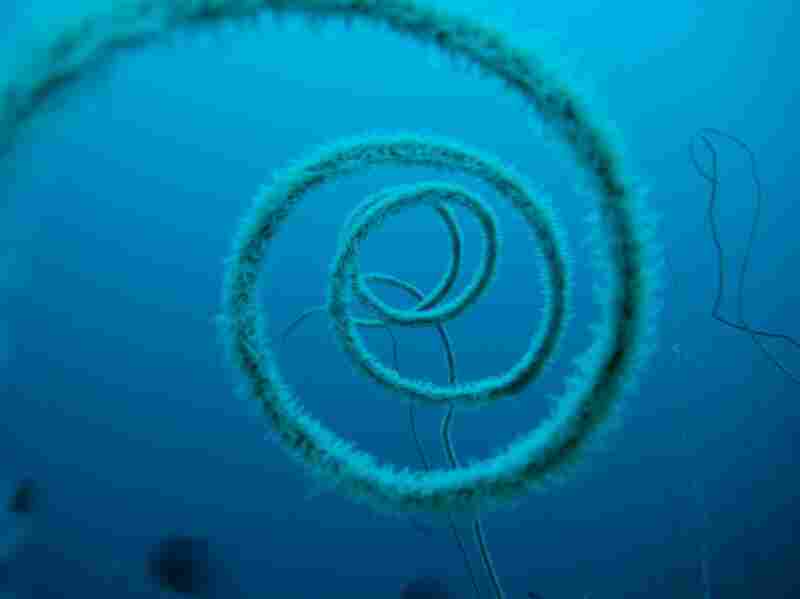 The feather-like structures are actually the gills of a worm that lives in a tube below. The "feathers" also function as filters that are used to capture food as it floats by. 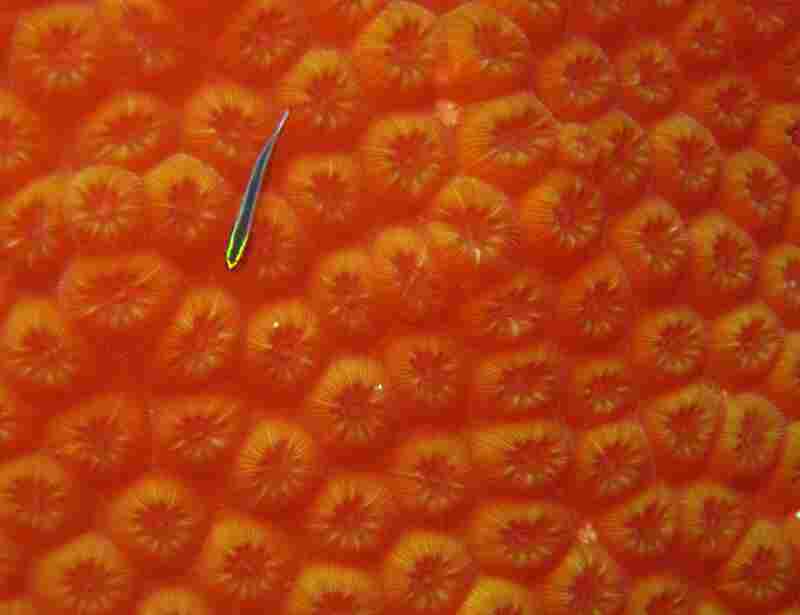 A small goby moves over the surface of a great star coral.The color of corals results from small algae that live inside the coral's tissue. These algae, called zooxanthellae, use sunlight to make sugars that the algae exchange with their coral host for other nutrients. 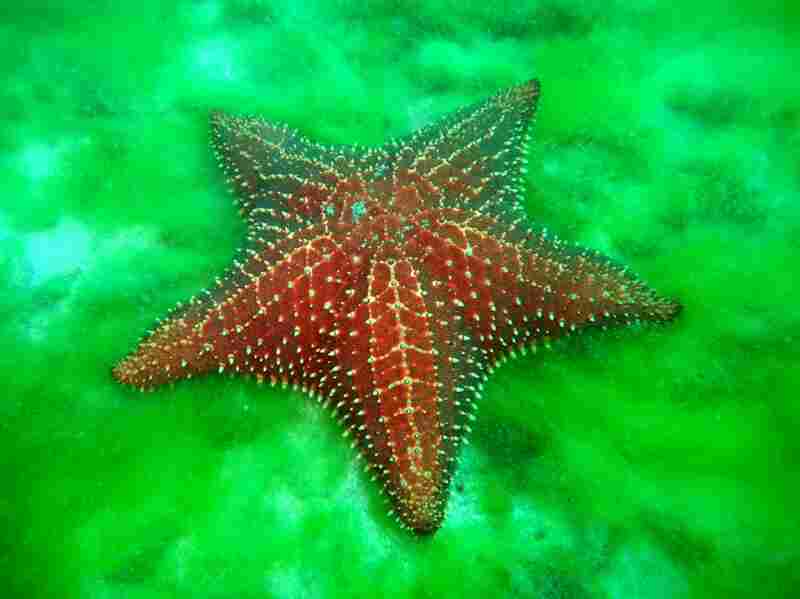 A starfish moves along the bottom of a sandy bay entrance that connects the reef to areas dominated by seagrass fields and mangroves. These inland bays are important "nursery habitats" for many fish species found on the reef. 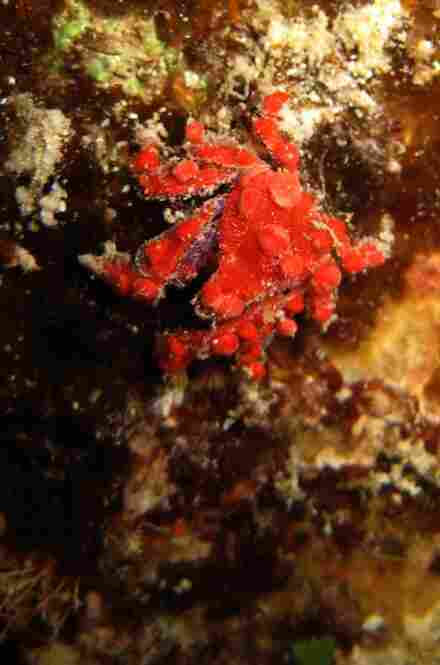 An arrowhead crab moves along the reef and uses its small colorful claws to collect debris and small food particles. These crabs act as little vacuum cleaners on the reef. Reef squid engage in a "romantic" dance. The squid seduces future mates through a series of mesmerizing color changes. Males often change color only on the part of their body facing a female, to conceal their amorous intentions from potential competitors. Teardrop crabs are small creatures that rely heavily on camouflage to escape predators. Like many crustaceans, these crabs come out at night, and explore the reef while most fish are sleeping inside. 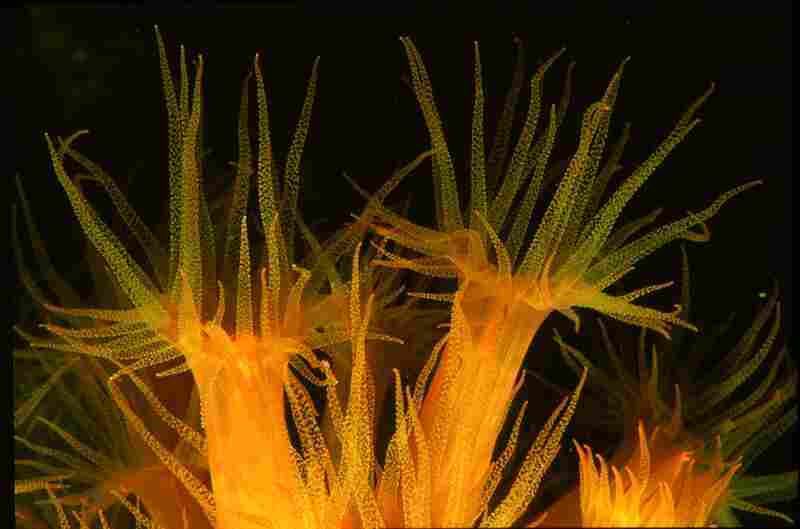 Despite their beauty, these orange cup corals are the only invasive corals in the Caribbean. They were first reported in the Netherlands Antilles in 1943, and probably arrived on the hull of a ship coming from the Pacific, where this species occurs naturally. Smooth trunkfish explore the underwater pilings in front of the CARMABI research station. 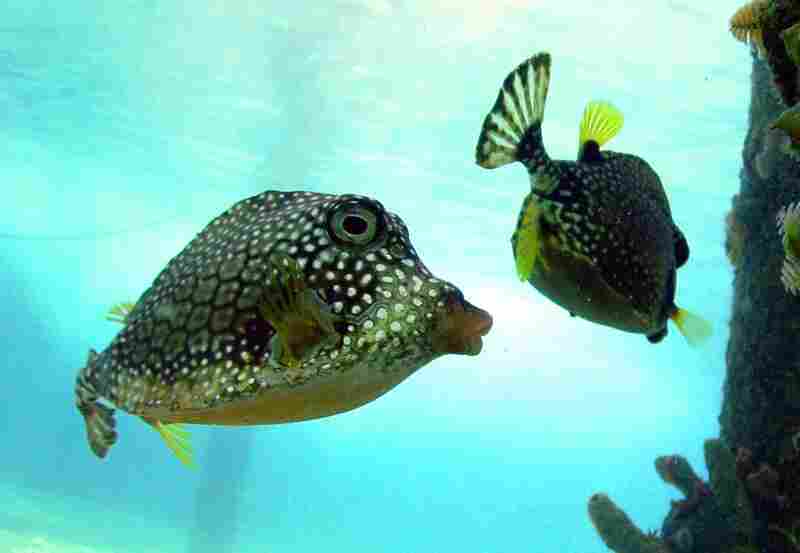 These fish "blow" water to stir up small bottom dwelling creatures, then eats them. For this group of juvenile grunts, brain corals provide shelter against predators. 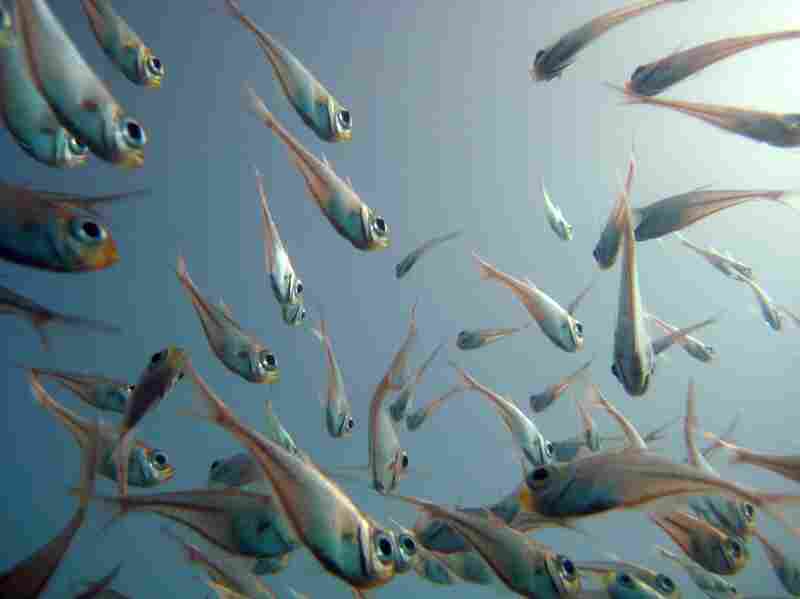 Small fish like these start their life offshore. After some time, they move in from the open ocean, "invading" the reef where they will grow and reproduce. 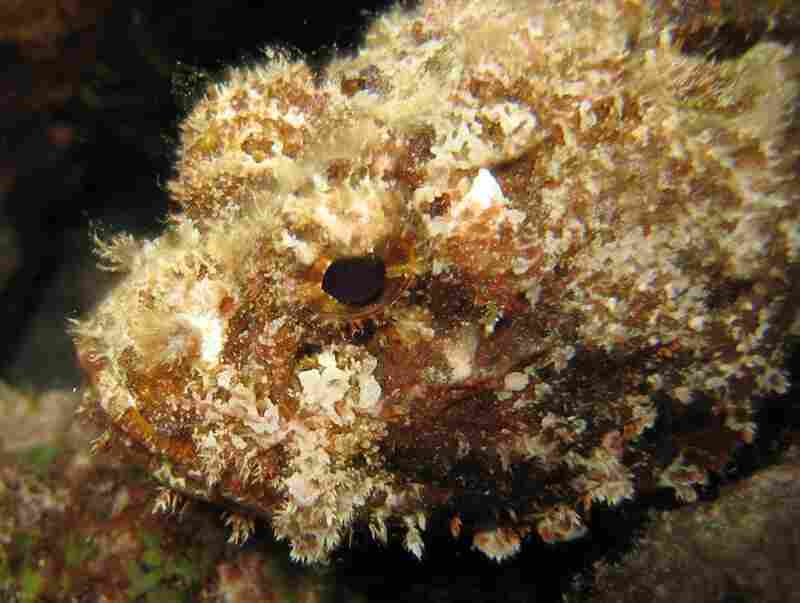 A scorpionfish elegantly blends in with the sea floor. Well camouflaged, it waits for small fish to pass by, then quickly engulfs them with its large mouth. Fields of gorgonians are often found in sandy areas with strong water currents. 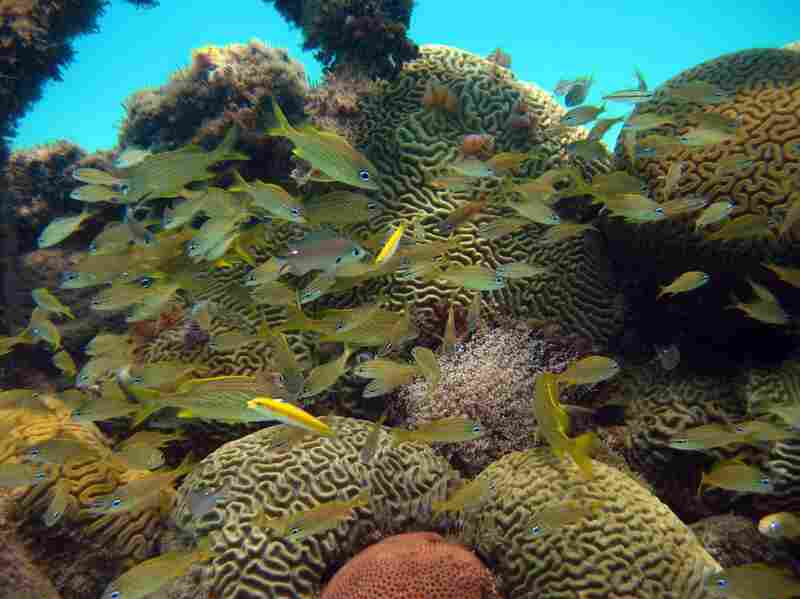 They provide shelter for a variety of reef organisms. Gorgonians have a flexible skeleton that allows them to move back and forth in the currents. 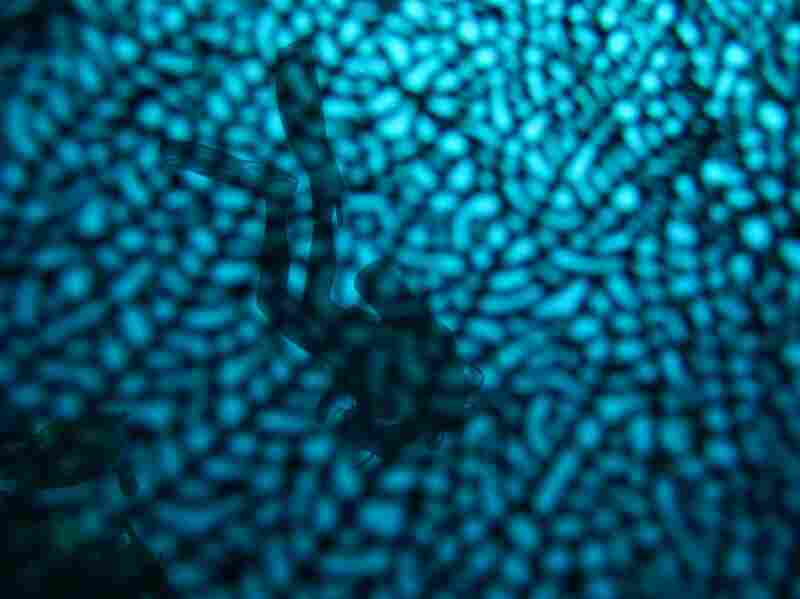 Seen through the lattice of a sea fan, a diver swims over a reef. 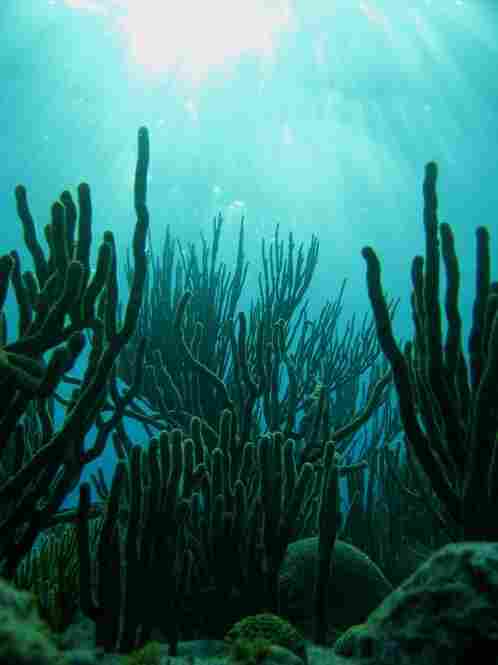 Sea fans are a type of gorgonian of which some 70 species occur in the Caribbean.